Groups are collections of accounts that share a common set of responsibilities, such as testers, developers, or marketing staff. By organizing accounts into groups, permissions, assignments and other properties or interactions can be set for many accounts at a time. To add a new group, navigate to System > Security > Groups	and select the Add Group	button. In the resulting Add Group dialog, give the new group a name by typing "Testers" in the Group Name	field. To finish creating the group, select OK	. The new group, Testers	, appears in the list. To add users to the Testers	group, select it and, in its Actions	menu, select Add/Remove Account	. 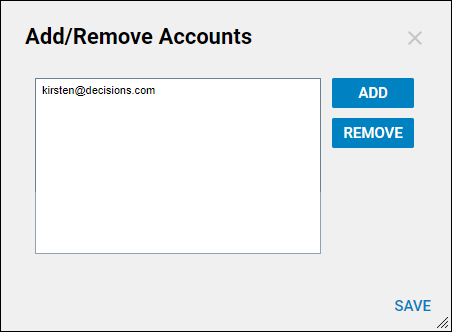 In the resulting Add/Remove Accounts dialog, select the Add	button. In the resulting Select Account pop-up, select an account and then OK	. The user now belongs to the Testers	group, as well as any other groups of which they may have been a prior member.